Appeared in all 82 games during a breakout sophomore season ... averaged 12.1 points, 3.8 rebounds, 2.1 assists and 1.0 steals in 30.0 minutes per game ... led the Bucks and ranked 12th in the NBA in 3-point shooting (.414) ... shot 54.0% (27-for-50) from behind the arc in February – the second-best mark in the league during the month ... recorded 20+ points in a game 12 times after never having done so in his rookie season ... tallied 10+ points in a career-best 10 consecutive games from 1/22-2/8 ... scored a career-high 29 points at WAS on 12/6 (11-for-22 FG, 4-for-7 3FG) ... logged a career-high 52 minutes vs. NYK on 12/18 and scored 20 points with a career-high 9 rebounds ... notched 27 points vs. PHI on 12/21 off of 11-for-15 shooting (.733) and was a perfect 10-for-10 from 2-point range ... swiped a career-high 4 steals in back-to-back games on 1/19 at SAS and 1/22 vs. DET. 2012-13: Appeared in 27 games (no starts) and averaged 6.1 points, 1.9 rebounds, 1.0 assists in 17.6 minutes … scored 10+ points eight times … scored career-high 14 points vs. DAL on 3/8 and grabbed career-high 7 rebounds at Brooklyn (4/17) … dished out career-high 4 assists twice (at MIN on 4/6 and vs. CHA on 4/12) … recorded career-high 2 steals six times … averaged 8.1 points and 3.0 rebounds while shooting 53% (27-51) from the field in April – his best offensive month of the season … assigned to the Fort Wayne Mad Ants of the NBA D-League from 12/14 – 12/17 where he averaged 11.0 points, 7.7 rebounds and 3.0 assists in three games … recorded 19 points (9-17 FG), 9 rebounds and 3 assists vs. the Maine Red Claws on 12/14 … inactive 27 times and DNP-CD 25 times. 2012 NBA Summer League: Appeared in all five games (two starts) for Detroit in the 2012 NBA Summer League in Orlando ... averaged 6.0 points and 2.8 rebounds in 23.3 minutes per game ... reached double digits with 12 points (5-5 FG, 2-2 3FG) in the Pistons win over BOS on 6/12. Named to Second Team All-Big 12 as a junior … made Wooden and Naismith Award watch lists in 2012 … participated in USA Basketball’s World University Games Team Training Camp over the summer of 2011 ... 2011-12: Averaged 13.2 points and 5.0 rebounds, which both ranked second on the team … scored 20 or more points three times in 20 games ... scored a season-high 24 points in 28 minutes vs. University of Louisiana-Monroe on 12/10 … recorded his first career double-double with 19 points and career-high 10 rebounds at Texas on 1/11 … tallied 23 points vs. Kansas on 2/22 and tied a season-high 24 points vs. the No. 3 Jayhawks in the Big 12 Tournament on 3/8 … averaged 19.5 points and 4.5 rebounds in the Big 12 Tournament … missed a total of 12 games during the season due to a right knee injury ... 2010-11: Led the Aggies in scoring (14.4 ppg) and free-throw percentage (.784) … ranked second on the team in rebounds (5.2 rpg), minutes (29.6 mpg), steals (39) and 3-pointers made (39) … scored a career-high 31 points in an overtime win over Arkansas on 12/18 … scored 28 points, including 11 in overtime, in a win over No. 12 Missouri on 1/15 … scored 10 of the Aggies’ final 14 points in a 67-66 win vs. Oklahoma State on 2/19 … won Texas A&M’s Most Improved Player Award for the season ... 2009-10: Averaged 7.2 points and 3.7 rebounds in 34 games … averaged 13.6 points over the last five games of the season while shooting 53.5% from the field, 54.5% from 3-point range and 100% from the free-throw line …Scored a season-high 19 points vs. Utah State in his first career NCAA Tournament game … averaged 15.5 points in Big 12 Tournament play. 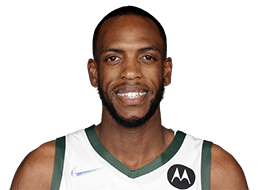 Selected by the Detroit Pistons in the 2nd round (39th pick) of the 2012 NBA Draft on 6/28/12 ... traded by the Pistons along with Brandon Knight and Viacheslav Kravtsov to the Milwaukee Bucks for Brandon Jennings on 7/31/13. Is the son of James and Nichelle Middleton … wears size 16 shoes and played baseball when he was younger … his favorite athletes as a child were Ken Griffey Jr. and Randy Moss, while Michael Jordan is his favorite athlete of all time … enjoys playing ping pong and played the piano in his younger years … his cousin, Josh Powell, played six seasons in the NBA ... participated in the first ever Bucks Bus Tour prior to training camp in 2014, visiting Madison, Janesville and Kenosha to interact with fans and host basketball clinics for children at a Boys & Girls Club and YMCA ... on Twitter as @Khris22m.